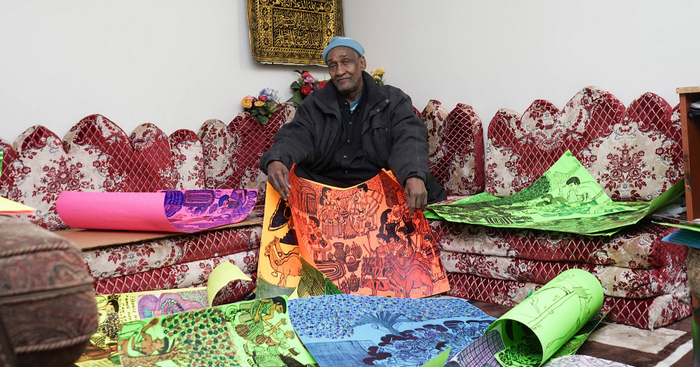 Mia recently opened “I am Somali,” the first major museum exhibition of work by contemporary Somali artists in the Midwest if not the United States. The title refers to one of Somalia’s best-known poems, Soomaali baan ahay, or I am Somali. Poetry, after all, has long been Somalia’s preferred medium for artistic expression—it is often called “the land of the bards.” This is in part because of the country’s long Islamic tradition, which discourages the visual depiction of people and animals while embracing the power of the spoken and written word. Yet Somali artists have also turned to other media, including drawing, painting, photography, and video. The artists featured in I am Somali work in three different media. Indeed, they belong to three different generations and bring three different perspectives to their experiences of exile, memory, and life as a refugee. Hassan Nor with his drawings. Hassan Nor, 81, and Aziz Osman, 69, were born in Somalia and grew up there, migrating to the United States in 1991 and 2002, respectively. Their drawings and paintings look to the past, depicting life in Somalia both before and just after the country’s long-running civil war began in 1991. Ifrah Mansour, on the other hand, was born in Saudi Arabia and raised in Minnesota. She is now 30, and her video installation invokes her experiences in the United States. Inviting the viewer into a confined space, she recreates the stares that she encounters in her daily life in the Twin Cities. 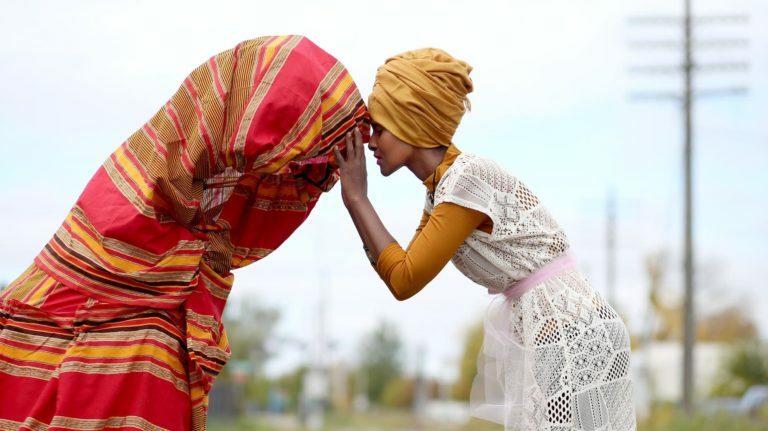 There is no real focal point for the Somali art scene in the Twin Cities, and I came to know these artists through different channels. Nor had his first gallery exhibition in July 2016 at the Third Place Gallery, an intercultural space run by photographer Wing Young Huie. Later that year, we were introduced by a friend of his, painter Pamela Gaard. With the help of Halwa Hussein, who translated for us between Somali and English, I was able to convey my interest in his work for a show at Mia. Mansour had given spoken-word performances at Mia in the past, and I first encountered her video work at an exhibition in September 2016 at the Darul Uloom Islamic Center in St. Paul, a show titled “Anomalous Expansion” and curated by Somali artists Kaamil Haider and Mohamud Mumin. Her artistic roots are in theater, and have continued to grow: she is bringing her solo puppetry performance about civil war through the eyes of a girl to the Guthrie Theater this winter. Osman, the artist with the most extensive artistic training (he earned degrees in architecture and painting while living in Florence, Italy), had reached out to Mia in the past. 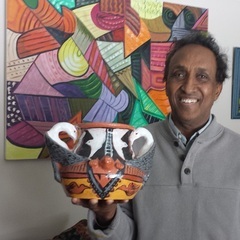 Earlier this year, we connected during an event at the Somali Museum of Minnesota, which has collected some of the paintings of his that I borrowed for the show. Aziz Osman with his artwork. The exhibition embodies Mia’s commitment to more accurately reflect the communities served by the museum, and to provide new visitors the opportunity to see themselves in the art on view. I am Somali benefited from the participation of the Somali Museum of Minnesota, and Mia’s African Art Department will only deepen its relationships with community organizations and individuals in the future. While this may be the first show of its kind, it should not and will not be the last.